Research shows that there are in fact, two distinct types of aging; intrinsic aging caused by our genes and extrinsic (external) aging which is caused by environmental factors – sun exposure being the biggest culprit. Lifestyle habits such as smoking, drinking and pollution leaches protective antioxidants from our skin surface making it prone to photo damage via free radical damage in cells leading to, among other things, premature wrinkles. Both intrinsic and extrinsic aging processes contribute to undesired aesthetic changes. Advances in understanding skin biology has led to the development of a number of technologies for rejuvenation of the skin. Extrinsic ageing usually begins in the 20s whereas the signs of intrinsic aging are typically visible in later decades. HIFU (High Intensity Focused Ultrasound) – this technique combines direct ultrasound visualization of targeted tissue with a non-invasive delivery of focused ultrasound energy. Precise micro coagulation zones from deep dermis to the superficial musculoaponeurotic system (SMAS) can be demonstrated. These zones cause gradual tightening of the skin through collagen contraction and remodelling. What makes us different is that we have devised modules of treatment to give maximum results with minimal pain and to prevent internal reflection of ultrasound waves which can cause nerve damage albeit even temporary. Photo Rejuvenation simply means use of lasers and lights to reduce fine lines, wrinkles, and the appearance of open pores, resulting in tight, better looking skin. Being non-surgical it is obviously cheaper but also takes a while for results to kick in. Home protocols such as sun protection, peptide applications, creams and oral skin rejuvenating vitamins hasten the results and maintain them. We are not adding or subtracting from your skin we are just stimulating it and as a dermatologist, it is in my favour to have patient satisfaction rather than subjecting patients to long drawn out treatments with no visible results. Different people react differently to therapies, so comparison or standard protocols are a no-no. We need to assess and tailor packages and take care of the financial aspects for our patients. Radio frequency is a very old modality of medical treatment which has now been technically evolved to treat skin sag and loss of elasticity. It generates heat inside a tissue, but the technology of micro needling radio frequency works by creating thermal micro zones which reach the deeper layers of skin like the dermis and stimulate production of elastin and collagen formation which helps in thickening and tightening of the skin. Because these are micro columns of heat there is no bulk heating, hence damage is non-existent. The heat helps in tissue regeneration and healing. The procedure requires mild surface anaesthesia and the actual procedure time is 20 minutes for the face. The advantage is that as it also causes micro channels we can combine the treatment with use of PRP and mesoproducts to enhance and hasten effects. Radio frequency skin tightening is a non-surgical treatment in which radio frequency (RF) energy is introduced to the skin. It creates measurable electrical currents that reshape and contract the skin’s collagen and then tightens the surface of the skin. RF energy penetrates both the epidermis and dermis to tighten and rejuvenate the skin, however it causes no damage to existing skin cells. The effects of the treatment can be attributed to heat that is generated by the RF waves and its ability to stimulate the protein fibres that keep skin elastic. 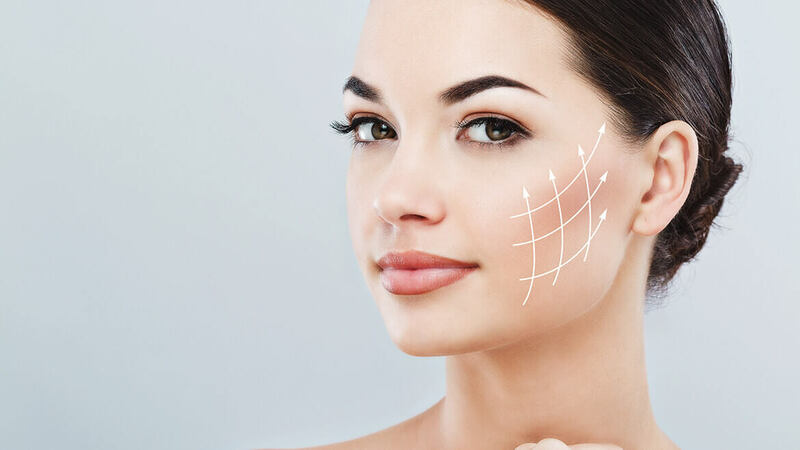 During treatment, the RF waves penetrate the skin to tighten it from inside out, as they stimulate collagen fibroblast production, which triggers the production of fresh collagen fibres, resulting in tighter, tauter skin which is noticeably younger. Platelet Rich Plasma (Vampire Facelift) will use a purified and concentrated portion of your own blood to regenerate collagen and rejuvenate your facial skin, resulting in vibrant and younger looking skin. This treatment has been made popular by Hollywood celebrities, but funnily enough we as medical dermatologists have been using the technique for years to treat hair loss, eczema and even skin ageing. Platelets help tissue to heal by growing new cells hence when injected in your skin, they promote collagen regeneration and growth which causes skin tightening and rejuvenation. What used to take us 40 minutes to separate now takes us minutes because of evolution in separator mediums and centrifuges. We pride ourselves on using only FDA approved and more importantly MOH and DHA approved materials. We have also had the distinction of asking for special permission to be allowed to do this procedure based on our credentials initially. Your skin ages depending on a variety of factors: which is lifestyle, diet, heredity, and photo damage. Anti-Wrinkle injections contain tiny amounts of Botulinum Toxin – a natural, purified protein which blocks the chemicals that stimulate nerve endings supplying the targeted muscle. This causes the muscle to not contract in habitual expressions and thus smoothen and relax the muscle. This in turn allows lines and wrinkles to disappear. The best results are noticed on dynamic wrinkles – that means patients should start early when overactive muscles cause lines which disappear on relaxation. Do not wait for wrinkles to become static, as Botulinum Toxin has limited use at that stage. Medical uses of Botulinum Toxin include treatment of migraines and injections to reduce excessive sweating in your armpits, on hands and soles of your feet thus improving life quality. Repeat injections are needed at various intervals depending on the body’s reaction to the toxin. Some patients develop a resistance to the toxin or have it inherently. To restore youthful fullness to your face, injectable fillers are a good option. They can plump thin lips, enhance shallow contours, soften facial creases, remove wrinkles and improve the appearance of recessed scars. Technical advances in injectable filler procedures allows us to now do a non-surgical facelift with use of support enhancing filers, and different planes of injection sites enhance the result. Use of different technologies in filler composition is important to determine which filler is appropriate for which area. Superficial fillers absorb water and enhance or boost the appearance of skin in terms of hydration, plumpness and a youthful glow. Fillers are made of hyaluronic acid which is a type of sugar present in the body tissues and cartilages. It acts as an inflated cushion to support facial structures and for tissues that may have lost volume due to the normal aging process. It also brings water to the surface of the skin, making the skin look fresh and supple. They also act as ladders to direct natural collagen formation. Skin boosters are exactly what they state. They boost the skins appearance by enhancing hydration, filling up fine wrinkles and lessening the appearance of pigmentation. Used in combination with certain lasers the effect is WOW. These are not volume enhancers but a superficial skin filler that gets you used to what fillers would look like – so if you want to try a lip enhancement but are scared, go in for boosters. To lift your skin from within, without the fear of fillers, boosters are your go-to.